Occasionally, I take a needlework class with no intention of finishing the project. 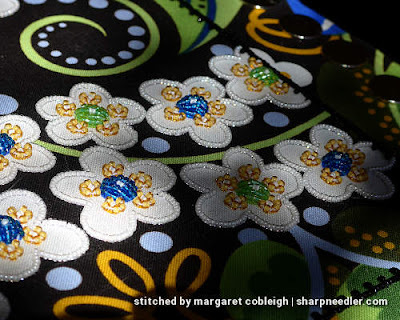 It's a rare occurrence, but sometimes I just want to learn a specific technique or see how a particular designer/teacher approaches embroidery work. That's not the case with Wild Child. I do want to finish the project, and I'm learning interesting things as well! 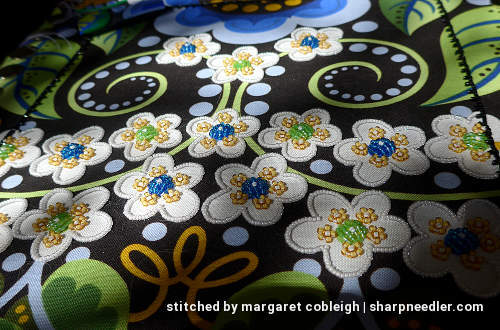 I have completed most of the stitching on the white flowers (outlines and centres). I'm still debating whether or not I'll fill them with randomly placed beads, but that decision can wait until the end of the project. I'm so glad the flowers are done! The outlining was tedious, but it allowed me to get much better at using the beading koma. 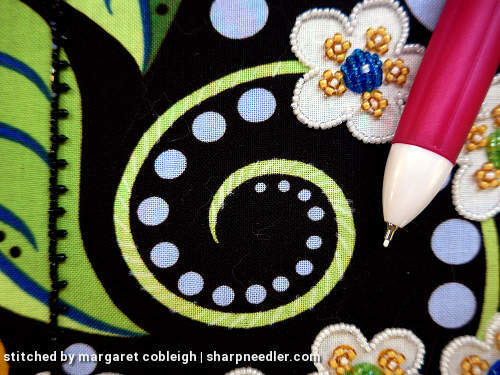 Next up are the green tendrils on which I initially used a white chalk pencil to mark stitch direction lines. I later redrew the lines in black chalk pencil as it was easier to see. The tendrils are stitched with a leaning satin stitch effect. I think of it as being a bit like a highly overlapped stem stitch. Each stitch is made up of three beads: one big bead in the centre surrounded by two small beads. Since I only have one bead holder, I decided not to mix the beads in the holder because that would be too much trouble when it came to putting the beads away. So, in order to keep the two sizes separate, I put the big beads on a string and used the holder for the smaller beads. It worked well. 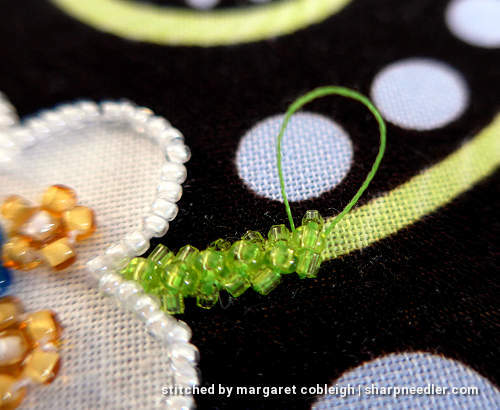 In the photo above, notice that there are some small beads on the bottoms of the stitches that are kind of turned. It actually looks a right mess in this extreme close-up! The beads are wonky because I didn't make the stitch length long enough. (I improved as I went along.) If I was having this piece judged or graded I would have pulled those stitches out and redone them. However, I know that little problems like this will be completely unnoticed by virtually everyone except perhaps me, and I may even forget over time. The beads are so small and there is so much going on on the purse that a few sideways beads will not be noticeable when the purse is completed. This is a learning piece and I like to give myself the room to make imperfect stitches. My rule is: If it will be noticed fix it, otherwise let it go. Life's too short and I have too many embroidery projects to spend time on unnecessary perfection! The completed curve is spectacular! I haven't yet found sufficient words to describe how cool it looks. 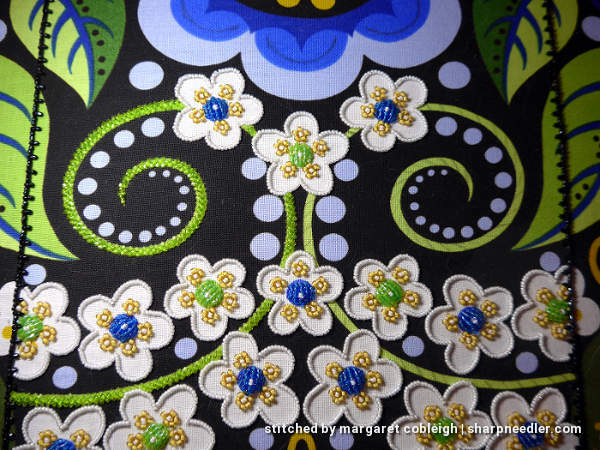 The fabric appears as if it has been enameled or bejeweled. 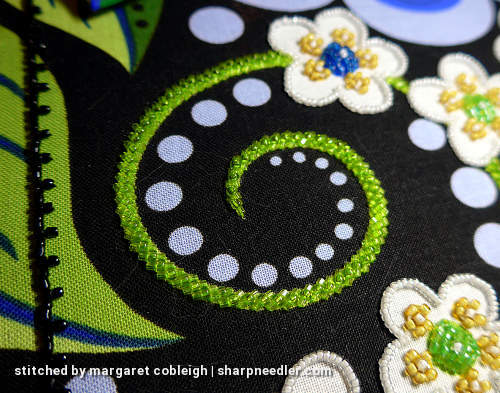 The green fabric beneath the green beads adds depth to the overall effect. The big bead in the stitch centres creates a spine down the middle and adds extra texture, which is a really nice touch on the part of the designer. This is by far my favourite technique learned on this project to date. I can imagine using this effect on other efforts. The before and after says it all for me (or perhaps that should be after and before!). 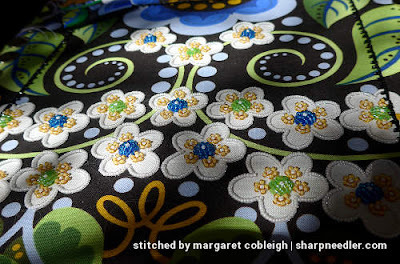 Thank you for sharing this interesting project Margaret! The stem is indeed amazing! I wish I had times to start a beading project too; my fingers itch :). I know the feeling. We all have so many projects and prioritising can be so difficult! Thank you, Aurelia. Bead embroidery is a lot of fun. Do give it a try! This is so lovely. Oh, how I wish you would come to Va Beach and teach this class! The project was designed and taught by Mary Alice Sinton. I'm sure she'd be happy to hear from you about teaching the project. Thanks for sharing Margaret. 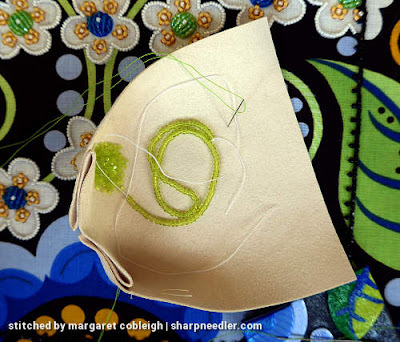 This is such a beautiful project, and I really love that green tendril. I can only imagine how amazing it must look in person! Thank you, Catherine! The tendril is stunning in person especially when the sun hits it. Photos definitely don't do it justice.